Background: Influenza A (H1N1) is a highly contagious virus derived from one of the several types of swine influenza A strains, called H3N2. It can be transmitted from person to person through sneezing or coughing. In 2009, pandemic influenza A (H1N1) emerged in some regions. This study aimed at investigating the mortality incidence associated with the 2009 H1N1 pandemic by a meta-analysis from 21 countries in the WHO Eastern Mediterranean Region. Materials and Methods: Literature search was carried out in international databases. In order to increase the search sensitivity, references were evaluated by hand searching. Finally, 33 eligible articles were identified by quality assessment and implementation of inclusion/exclusion criteria for meta-analysis. The heterogeneity among the results of primary studies was defined by Q and I2 tests. The mortality rate of confirmed cases based on different countries and confidence intervals (95% CI) is shown in the forest plot. 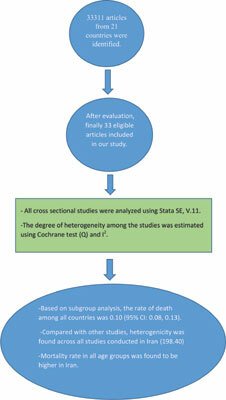 Results: This meta-analysis included 33311 articles from 21 countries. The incidence of H1N1 2009 mortality was variable across different countries. Based on subgroup analysis, the rate of death among all countries was 0.10 (95% CI: 0.08, 0.13). Compared with other studies, heterogenicity was found across all studies conducted in Iran (198.40). Conclusion: This meta- analysis showed that the incidence of mortality varied among different areas in the WHO Eastern Mediterranean Region. Mortality rate in all age groups was found to be higher in Iran; probably due to some underlying conditions such as lung disease, neurological disorders, diabetes, pregnancy, changes in immune system, and cardiac and respiratory failure. Incidence, infection, influenza, meta-analysis, mortality, H1N1.